While freelancing has become very popular there still exists some misconceptions about it. Some people don’t take it seriously and don’t consider remote jobs to be “real.” Others think it’s a fad and not something a responsible adult would do long-term. Personally, when I tell people I’m a freelancer I usually get one of two reactions. The first is: Wow, that’s cool. Wish I could work from home, too! The second reaction is a bit less enthusiastic: Do you wear pajamas all day? (Err, sometimes…) or Do you actually do any work? Maybe you’re not sure yourself how sustainable it can be, so I’ve addressed six of the most common myths about freelancing in order to give you the truth. I’m going to be honest here. As a freelancer I can do what I want—sometimes. And when I say I get to “do what I want” I mean I make appointments in the middle of the day or run errands while stores are quiet. I don’t mean that I get to hop on a sailboat and drink champagne all day while everyone else is at the office (although I wouldn’t say no if I had the chance!). I have clients who work traditional work hours and I have to be available to them on their terms. This is in case we have to Skype or go over project guidelines, or an emergency comes up with a short turnaround time. I’m also juggling more than one project in a day so my day is consciously planned out. Occasionally I’ll watch a movie if I’m feeling spent (usually cuz I stayed up working late), or I’ll meet a friend for lunch or do some baking. But those activities definitely aren’t every day. And in my High-Level Proofreading Pro course, I prepare students for maximum productivity, too. Some people I know still don’t consider what I do “real” work—once someone even said that I was temping! People have had to work in controlled work environments for so long that there’s still a struggle to equate flexibility with professional achievement. The number of remote workers is rising, and by 2020 it’s predicted that at least 50% of workers in office environments will have some option of remote working available to them. It’s becoming more common for companies to allow employees to work online, and it actually saves a lot of money on overhead costs. So for anyone to think that freelancers don’t do real work is just plain insulting. 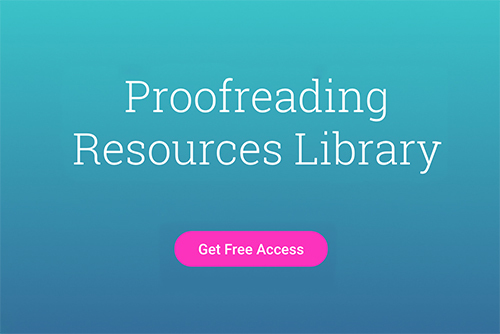 If you want to learn what it takes to start working as a money-makin’ freelance proofreader, I’ve got a 30-minute free workshop you’ll want to catch. Sign up here for “How To Work As A Proofreader For Businesses & Writers”. This freelancing myth is total BS. When I was in university I met many successful freelancers who made good living wages, and it was seeing their comfortable level of freedom that instilled my dream of becoming a freelancer. A few years ago, my husband decided to go back to school, so I became the sole provider for our family. That means I cover everything including the mortgage. Obviously we’re not taking weekend trips to the Bahamas but we’re doing fine. It takes time and determination to get yourself to the point where you have regular work you can count on, and a reliable stream of income, but it’s totally possible to survive as a freelancer— without having to eat ramen every night. Some people believe that if you’re a freelancer you can’t go very far in your field. That’s not true. You can absolutely move your proofreading career forward to a higher level of editing, or make a lateral move into a new niche. I always encourage people to look ahead, even if you’re perfectly content career-wise. You can’t predict the future but you can ensure your place in it by looking at trends, keeping abreast of news, and networking. Developing your skills through courses, books, mentoring, and workshops is also essential. You can get creative and explore how your skill set would work in another industry. For example, if you want to build your proofreading services with SEO knowledge, check out courses on learning sites like Lynda.com. As a freelancer you’re able to write off any classes for your taxes, as well. One of the few downsides of freelancing can be social isolation, and sometimes you find yourself like the character in this hilarious comedy piece in The New Yorker. But we’re average people just like anyone else. In a recent Forbes study it was shown that remote workers are happier than people who work in an office all day. While it’s true many freelancers tend to be introverted, we do seek out human interaction so we don’t feel so alone, even if it’s just to be surrounded by others. That’s why you’ll find us in coffee shops, eating lunch on a park bench, or at the gym. I make a point of socializing with other parents every day after school when I pick my son up. This is the opposite of thinking freelancers don’t really work. (Give us a break, yo!) It’s true that we can’t really leave work behind at the office because, well, home is our office, but it is possible to maintain a healthy work/life balance. An editor friend of mine turns off her laptop and keeps it out of sight when her daughter comes home from school. I keep mine on for projects that I can easily jump in and out of. I do this when my son is home because I can do a lot of proofreading in the 30 minutes it takes for dinner to cook, or while he’s playing Lego. Are there any myths about freelancing that you’d like addressed? Outstanding and unstoppable post. So true! Cheers. Thanks for this post. I know I’ve had my own misconceptions about freelancing. I’ll have to check out your links.